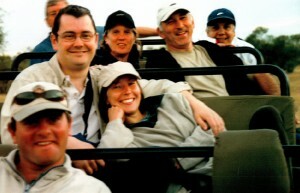 Travel Butlers are safari specialists based in Weybridge, Surrey in the United Kingdom. We help hundreds of people plan and book their trip to Africa each year, and all of our consultants are experts with at least 10 years experience of the region. Inspired by a holiday to South Africa in 2002 that included a week on safari, Tracey and Paul Campbell set off on a career break adventure in 2003 that ended up shaping their personal and professional lives. As Paul recalls, "We were all set to travel the world and we spent a good chunk of time in South America, but shortly after arriving in South Africa, we found ourselves completely hooked. Everything about South Africa grabbed us – the culture, the incredible beauty of the landscape, the people, the wine and, above all else, the amazing wildlife. We couldn’t wait to find out what the rest of Africa had in store, and the more we explored, the more in love we fell. Each safari left us hungry for the next one and we soon realised that we had become hopeless Africa addicts." It was then that they had their lightbulb moment, and had the idea to build a company to help people from all over the world enjoy the best wildlife experiences of Southern Africa. Once this idea had taken hold, there was no going back. As Paul says, "We knew immediately that we wanted to become real experts in our field, so we spent a year travelling throughout Southern Africa on a hunt to discover the perfect locations and safari holidays to offer our customers. We even trained as safari guides ourselves in the Sabi Sands Game Reserve in order to really understand the ways of the African bush and its abundant wildlife. As you can probably tell by now, we don’t do things by halves!" Initially the company specialised in South Africa and Namibia, where Tracey and Paul felt they could offer the most comprehensive advice. Over the years, we've expanded to sell the whole of Southern Africa as well as Kenya, Tanzania and the Indian Ocean. Tracey, Paul, and the other members of the team continue to explore at every opportunity so that we can advise our customers from our own personal experiences, and we’ve visited the majority of the safari lodges that we feature on our website. Because we appreciate that everyone is different, we tailor every Travel Butlers holiday to each client's specific requirements rather than work on a 'one size fits all' approach. If you click here you can see examples of some of the trips we can organise for you, but keep in mind that these are just examples and every holiday we put together is totally unique rather than off-the-shelf. We put a lot of care and thought into planning the right holiday for you – and we really do not mind how many times we make changes, as long as at the end of the day, you get the holiday you want and which has not blown your holiday budget out of the water. And once you have booked with us, we don’t forget you either...we provide a full set of travel documents, including vouchers, directions and contact phone numbers for every place you have booked for your trip of a lifetime. 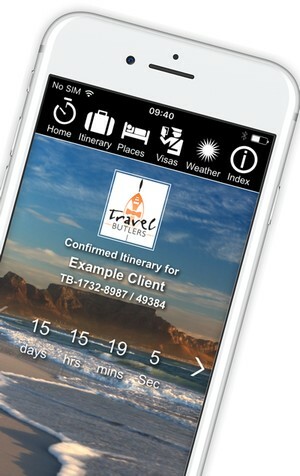 Most of this information is now also available on our free Guest App for Android and IOS, along with a countdown to your trip, live updates on schedulled flights, 5 day weather forecasts, and inteactive maps of the places you will stay. The Travel Butlers service does not end there - we are on hand to answer any queries or book additional services right up to the day you fly, and our 24 hour emergency numbers ensure we are also available to assist in the event that you need us whilst you are abroad. We are thrilled to have won a number of awards over the years, including a couple of "Best Tour Operator" awards at the SATOA Travel Awards. We were also delighted to be recognised as a Gold Trusted Merchant for the third time by Feefo in February 2018. The Trusted Merchant scheme is designed to recognise companies that give excellent service to their customers and is based on independent customer reviews compiled by Feefo. The Gold Trusted Merchant is the highest level of this award, and our heartfelt thanks to all the clients that have given us such lovely reviews on Feefo over the last few years. You can read more about the Trusted Merchant scheme on the Feefo blog, or read the independent reviews of Travel Butlers from Feefo here. We are ATOL bonded, so if you are from the UK and you book a holiday with us that includes any flights, your holiday will be covered by this licence. If you book any other package with us (so a combination of accommodation plus a hire car and/or a transfer), or if you are from any other country then you trip will be covered by our ABTOT bond. You can read more about the financial protection we offer here: Financial Protection. We work with suppliers from all over Africa to bring out clients the best Special Offers on Safari Lodges, and we will always include these on our clients itineraries where possible. Once a price is agreed, we also do NOT charge anything extra if you want to pay us by credit card or debit card - so it really is what you see is what you get. Our offices in the UK are open from 09:00 to 17:00 Monday to Friday. Clients who are travelling with us and who need to contact us while away should call one of the office numbers listed below during normal office hours, otherwise pleaese call the emergency 24 hour contact numbers that you will have received with your travel documents.